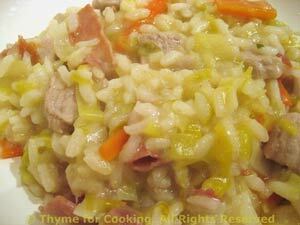 Easy Dinner from Thyme for Cooking: Risotto with Veal and Leeks. Yes, veal is a bit decadent for a Sunday... But, occasionally we just have to treat ourselves. You could use pork or turkey. Finish with some juicy Clementines.